I’ve been on vacation the last two days. To say it’s a vacation is an overstatement, but nonetheless, it has given me an opportunity to step back from work a little bit, recharge and regain my focus. So it is with this blog, too. I’ve been going heavy for a short three months and I feel like I need to take a step back and level my focus. Remember the basics. 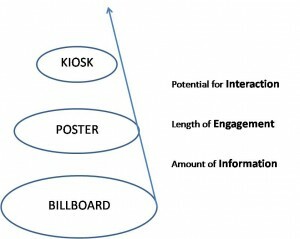 This diagram is the foundation for the way that I look at OOH. DOOH & IOOH are just additions onto this model. But to me, this is the most basic representation of how I view this world. 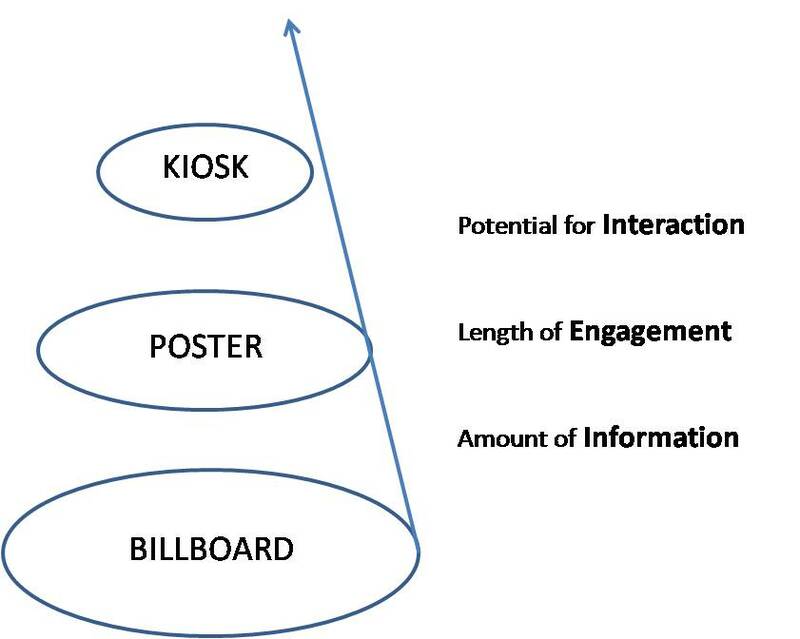 There are 3 buckets that all OOH initiatives fall into: Billboards, Posters, and Kiosks. They are separated by 3 differentiating factors: amount of Information, length of Engagement, and potential for human Interaction. Advertisement on top of a taxi (or the side of a bus): I would say that this is a billboard. These usually have very little information, no potential for human interaction and the length of engagement is very low due to the environment (transit) that they are viewed in. Advertisement behind home plate in a baseball stadium: Again, I would say that this is a billboard. Little information. No potential for human interaction and while the length of engagement is longer in this setting, the other two factors handicap any “real” engagement. Movie poster: Easy enough – poster, but posters are interesting. By design, they’re effective at including more information than billboards (and less than kiosks). And because they have more information, people can actually walk up to them, touch them, and “engage”, even if it means absorbing information. Mall directory: I would say that this is a kiosk. Lots of information. Designed for human interaction and as a result, enable longer interaction. All of this becomes clearer when you start adding technology to the mix. I believe that there are technologies that simply make them “digital” and then other technologies that make them “interactive.” But we’ll get into those later. This is important because as a marketer, I feel like this helps hone in what one should be doing in this arena. I’ve got some marketing-specific additions to the model, too. But we’ll take it one step at a time. We’ll get to it. What examples do you want to put to the test? This entry was posted in Marketing and tagged Billboards, Kiosks, OOH, Out of Home, Posters on 03/26/2010 by Mike Cearley.